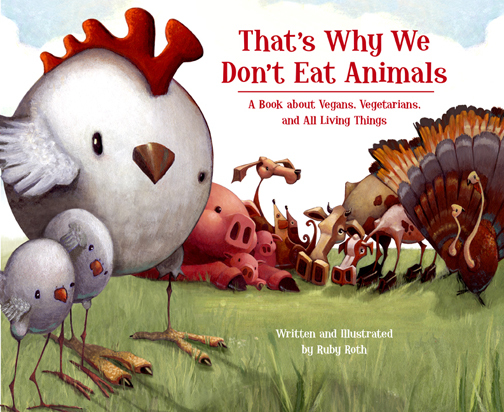 Ruby Roth, the amazingly talented author & illustrator of the children’s book “That’s Why We Don’t Eat Animals”, has asked me if I would review her book on my blog. I must say that I am truly honored and flattered, that she finds my blog worthy. 🙂 Thank you Ruby! I bought this beautifully written & illustrated book for my daughter Ava’s fourth birthday. Since then, it has become a mommy & daughter bedtime favorite! My little girl has a deep compassion for animals, and although I would never want to scare her with graphic details of today’s factory farming, I do want her to have an understanding of “why” we live compassionately, and choose not to eat animals. Ruby’s book “That’s Why We Don’t Eat Animals” enlightens the young reader and explains that farm animals are truly no different from our beloved pets. She offers us a touching look into the bonds these creatures form with their children, similar to the bonds we have with our own sons and daughters. We learn about the “moods” of cows, the”loving nature” of pigs, and the “sensitivity” of turkeys. The book illustrates the sad, short lives, factory farmed animals live, and tugs on your heartstrings from start to finish. Ruby’s beautiful illustrations are colorful and whimsical, and they have a way of keeping my daughter’s eyes glued to the page! Ruby also takes us on a journey to visit our oceans & the fish and other marine life that live there. We learn how commercial fishing hurts these creatures, and why they are best allowed to live freely. Ruby describes the toll we are taking on our planet, simply by not caring for, and protecting the animals who roam along side us. As Ruby brings her book to a close, she tells us about endangered species and the importance of our rainforests. Along with ideas for children to help animals and our environment. This is by far the most gentle, yet eye opening, animal rights book available for our youngest generation! “While the power of nature can move mountains and make rainbows, the power we have as humans is boundless too. Every day, we have the freedom to change our lives. In fact, when we treat animals respectfully, we practice world peace. That’s why we don’t eat animals”.